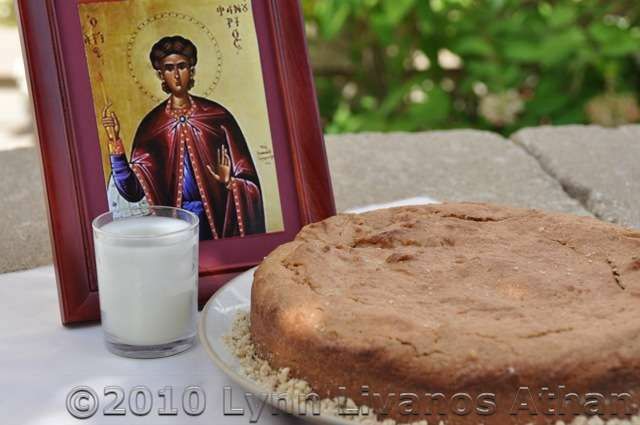 Each year on August 27, the Greek Orthodox faithful bake a cake in honor of Saint Fanourios (fah-NOO-ree-os) and bring it to church to be blessed. Fanourios comes from the Greek verb fanerono, which means "I reveal." Worshipers believe he can help them find what they're looking for, be it a lost object, a future spouse, or even a new meaning in life. So they bribe, er, thank him with a cake. But there's no reason to wait until St. Fanourios Day to enjoy this treat. Like a dense but moist, lightly sweetened spice cake, fanouropita makes a welcome nosh with coffee or tea and can even stand in for a muffin at breakfast. Traditional recipes call for olive oil (Greek, of course), but you can use sunflower or canola oil in its place, with slightly different results in taste. The thick batter responds more like a dough, so you'll need to stretch and press it a bit into the pan. Lightly grease and flour a 9-inch (24 cm) round or square cake pan, or line the bottom with lightly greased parchment paper. In a large bowl, whisk together the oil and the sugar until well combined. Add the orange juice, brandy, spices, and baking powder and mix well. Using a spatula, incorporate the flour in batches into the batter, continually scraping the sides of the bowl, and mix until just combined. Stir in the ground walnuts and raisins. Transfer the batter to the cake pan, pressing it out to the edges and smoothing the top with the spatula. Bake for 45 to 50 minutes or until the cake turns golden and a toothpick inserted at a few different points comes out clean. Try a lemon or orange liqueur in place of the brandy. Swap dried cranberries or currants for the raisins. Opt for almonds, pecans, or pine nuts instead of walnuts. Add a sprinkling of sesame seeds to the top before you bake it or a dusting of confectioners sugar after it cools. Mix up the spices with any combination of cinnamon, cloves, allspice, nutmeg, ginger, and cardamom that you like. If you prefer to stick with the tradition of seven (or nine) ingredients, representing the seven (or sometimes nine) sacred mysteries of the Church, you can use all cinnamon and eliminate the raisins and ground walnuts.